Wednesday, May 24, 1911: One of these days I’m going to do something of some importance. I’m getting rather tired of the same old duties, the same old ways, and the same old troubles. Whew, the same old duties, the same old ways, and the same old troubles. I wonder what Grandma was referring to. Sometimes I wish that she’d tell us more about what her daily duties were—and what she didn’t like about the “old ways”. But of course she couldn’t have known that we’d be reading her diary a hundred years later . . . Since she didn’t tell us much about what happened, I’m going to try to guess what foods the family have might have been eating in late May. They were probably enjoying fresh greens, radishes, and other spring vegetables from their garden. They probably were also eating rhubarb. It used to be considered one of the spring tonic foods (dandelion was another) that helped restore people’s energy and health after a long winter without fresh foods. Mix all of the ingredients together in a saucepan. Using medium heat, heat to boiling; reduce temperature and simmer until tender (about 5 minutes); stir occasionally. Remove from heat. Can be served either hot or chilled. 2-3 servings. Recipe can be easily doubled or tripled. The amount of sugar can be adjusted to make the rhubarb tarter or sweeter. My husband’s family also ate Stewed Rhubarb when he was a child—and he agrees that the recipe turned out perfectly. He took seconds—and we easily ate all of the rhubarb at one meal. (Next time I’ll make more). And, he suggested that we should have it again soon. It’s definitely an old-time food that we’ve enjoyed rediscovering. Posted on May 24, 2011 August 23, 2015 by SherylPosted in Food, recipesTagged dessert, rhubarb. 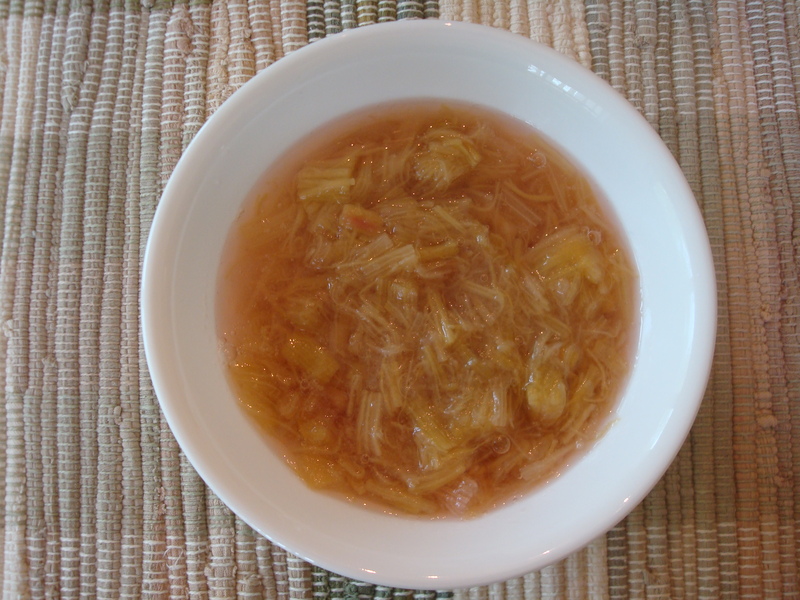 My husband also enjoys stewed rhubarb (we call it rhubarb sauce), and we eat it all winter, using rhubarb that I chopped in the spring and froze. Instead of applesauce, use rhubarb sauce! The sauce that I made was very juicy. I’ll have to try adding cornstarch the next time I make it. Thanks for the suggestion! Your mother’s way of making stewed rhubarb sounds really yummy. I have lots of rhubarb and am going to try it soon. I love Rhubarb, too. When I was little my Aunt Esther made it, but she made about double or triple this amount at once and then added a package of Strawberry Jello to make it redder and sweeter. I also use a bit of cornstarch to thicken it a bit. Nowadays I use the sugarfree jello. This sounds really good, too! As I’ve read the various comments, I’ve been amazed how many variations there are to this recipe.